Hestan—the award-winning culinary brand renowned for creating the market's most advanced, powerful and versatile commercial kitchen equipment—is preparing to once again turn up the heat atThe NAFEM Show 19, February 7-9 in Orlando, Fla., at the Orange County Convention Center. This year, Hestan executives will be on hand in booth 238 to spotlight the brand’s award-winning commercial line, with an emphasis on its Upright Convection Ovens and Open Burner Rangetops — both the masterful results of calculated research and engineering in partnership with some of the most respected chefs and consultants in the country. 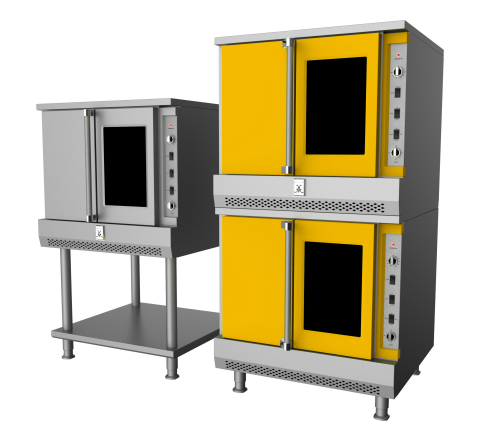 Upright Convection Ovens: Hestan’s upright convection ovens mark its expansion into yet another category of cooking and answer the demand from customers looking for larger production capability. Energy efficient, the ovens provide extremely consistent results at a larger oven capacity than previous models — optimal for baking in high volumes. With precise site lines and a low-profile convection fan system, the ovens feature a small back-to-front footprint, ensuring lineup with the same depths as the rest of the heavy-duty line. Open Burner Rangetops: Hestan’s open burner rangetops are designed to focus heat towards the epicenter of its brass burners, creating an unprecedented balance for accurate cooking. The burner systems can produce power as high as 35,000 BTU/hour and as low as 1,500 BTU/hour — providing ideal searing, broiling and simmering — so the rangetops are as flexible as the chefs using them. Heavy-gauge welded body construction, highly polished stainless steel rod grates and the removable lift-out burner bowl ensure durability and easy cleaning, while providing long-lasting functionality. For more information about attending the event, please visit https://www.thenafemshow.org/for-attendees/. For more information about Hestan, please visit https://commercial.hestan.com/. ABOUT HESTAN: Hestan is the award-winning culinary brand renowned for creating the market's most advanced, powerful and versatile commercial kitchen equipment, premium outdoor grills, and now an indoor of appliances. Founded by culinary icons Stanley Cheng and Eric Deng, and backed by some of the industry's most inventive and forward-thinking chefs and engineers, Hestan is forging new ground with visionary technologies and products. Headquartered in the heart of Southern California in a 130,000-square-foot, state-of-the-art manufacturing facility that includes a showroom, test kitchen and innovation lab, Hestan is led by a collaborative team of industry mavericks who bring together over 200 years of combined experience to create thoughtfully designed products that respond intelligently to the needs of the end user. Equipping the kitchens of acclaimed restaurateurs and Michelin-starred chefs such as Thomas Keller, as well as the legendary Culinary Institute of America, Hestan is setting the pace of the culinary evolution with products that provide the confidence and comfort of the highest quality materials and top craftsmanship. For more information, visit www.hestan.com. Editor’s Note: To schedule an appointment with Hestan representatives, contact Marta Bistram via email: marta@beyondfifteen.com or by phone: (949) 733-8679 x 114.